Properties in Maggie Valley average 4.7 out of 5 stars. Private and quiet mountain getaway. New construction! Property 8: Private and quiet mountain getaway. New construction! Property 15: EZ Access - On Jonathan Creek - No Steep Inclines - WiFi - Max (Gold) Cable pkg. Property 16: Easy access, minutes from skiing, pet friendly, wifi and cable, cleaning incl. 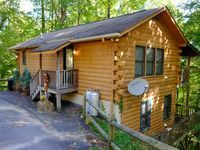 Ponderosa Log Home, Spectacular Mountain Views, Free WIFI, And Many Amenities..
Property 22: Ponderosa Log Home, Spectacular Mountain Views, Free WIFI, And Many Amenities..
Property 31: “Living The Dream” - Private Log Cabin w/ Mountain Views Has It All! On Jonathan Creek! Family Oriented! Small Dogs Accepted! Close to Everything! Property 35: On Jonathan Creek! Family Oriented! Small Dogs Accepted! Close to Everything! Property 41: Pet friendly..handicap access..easy winter entry..
'OVERLOOK FALLS' - Gorgeous Home with Hot Tub view of 2 mtn streams/waterfall! 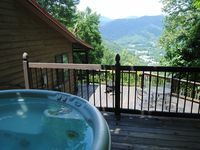 Property 47: 'OVERLOOK FALLS' - Gorgeous Home with Hot Tub view of 2 mtn streams/waterfall!